A genus of about 25 species, of wide geographic distribution, mostly in tropical regions. 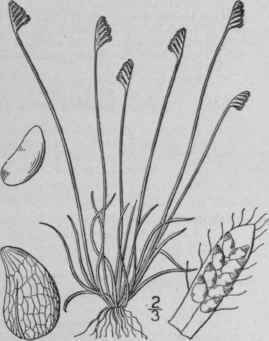 Type species: Schizaea dichotoma (L.) J. E. Smith. Schizaea pusilla Pursh, Fl. Am. Sept. 657. 1814. Rootstock minute, horizontally creeping, the leaves tufted. Sterile leaves linear, very slender, flattened and tortuous. Fertile leaves longer, 3'-5' high, the fertile portion terminal, consisting of about 5 pairs of crowded pinnate divisions, forming a distichous spike; sporanges ovoid or pyriform, sessile in two rows along the single vein of the narrow incurved linear divisions of the fertile spike, partially concealed by the incurved hairy margins. In wet soil, pine barrens of central and eastern New Jersey, the historic region. Also in Newfoundland and Nova Scotia. Rare and local. Aug.-Sept.